TONI&GUY Milton Keynes opened in Milton Keynes centre in 2000. Comprising of a strong team of talented, passionate stylists and technicians, who will ensure your TONI&GUY experience is a fabulous one for both you and your hair. As a salon we pride ourselves on providing a professional and friendly service. Our team of stylists and technicians are on hand to give you expert advice and create hair that is individual and easy to live with, interpreting fashion trends with versatile wearable styles. We offer many services including Bridal and Occasion hair, Keratin Smoothing treatment and Afro-Caribbean. 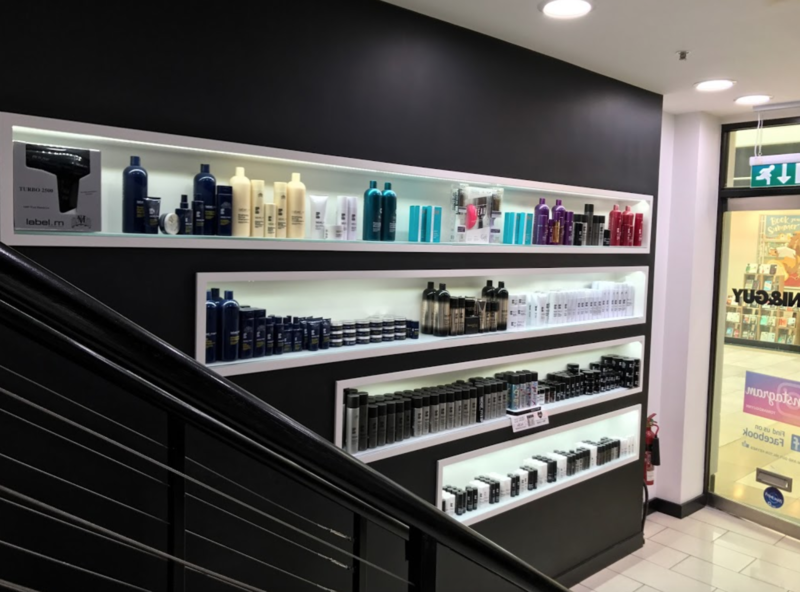 Our wide range of hair care products include label.m, Kerastase, GHD, Moroccan Oil, L’Oreal and Tangle Teezer to keep your hair, salon perfect until your next visit. Love having our haircut with Michelle, so fun and great results. Hey Helena, thank you for taking the time to leave us a review. We are always pleased to hear feedback from our customers and we are happy to hear that you enjoyed your experience with Michelle. Regards, TONI&GUY Milton Keynes. Fabulous! I always leave feeling very pleased with my hair. Hey Suzanne, thank you for taking the time to leave us a review. We are always pleased to hear feedback from our customers and we are happy to hear that you enjoyed your experience with Joe. Regards, TONI&GUY Milton Keynes. Hey Kerry, thank you for taking the time to leave us a review. We are always pleased to hear feedback from our customers and we are happy to hear that you enjoyed your experience with Kitty. Regards, TONI&GUY Milton Keynes. Hey Richard, thank you for taking the time to leave us a review. We are always pleased to hear feedback from our customers and we are happy to hear that you enjoyed your experience with Lou. Regards, TONI&GUY Milton Keynes. Hey Shelley, thank you for taking the time to leave us a review. We are always pleased to hear feedback from our customers and we are happy to hear that you enjoyed your experience with Rachael. Regards, TONI&GUY Milton Keynes. Joe is an incredible hairdresser and a pleasure to spend time with. I’m always thrilled with the end result and he is really generous with his advice. Plus we always have a giggle! Hey Peta, thank you for taking the time to leave us a review. We are always pleased to hear feedback from our customers and we are happy to hear that you enjoyed your experience with Joe. Regards, TONI&GUY Milton Keynes. Hey Betty, thank you for taking the time to leave us a review. We are always pleased to hear feedback from our customers and we are happy to hear that you enjoyed your experience with Robert. Regards, TONI&GUY Milton Keynes. Hey Sue, thank you for taking the time to leave us a review. We are always pleased to hear feedback from our customers and we are happy to hear that you enjoyed your experience with Hannah. Regards, TONI&GUY Milton Keynes. Very pleased with my haircut today. Hey Lina, thank you for taking the time to leave us a review. We are always pleased to hear feedback from our customers and we are happy to hear that you enjoyed your experience with Michelle. Regards, TONI&GUY Milton Keynes. I love having my hair cut in Toni & Guys Milton Keynes and Hannah always does a perfect cut. The atmosphere is great, I always come away feeling properly pampered and relaxed and having had a good chat. Thanks Hannah! And everyone else who looks after me while I’m there! Hey Kate, thank you for taking the time to leave us a review. We are always pleased to hear feedback from our customers and we are happy to hear that you enjoyed your experience with Hannah. Regards, TONI&GUY Milton Keynes. As always, looked after really well by Jasmine. Thank you. Hey Sana, thank you for taking the time to leave us a review. We are always pleased to hear feedback from our customers and we are happy to hear that you enjoyed your experience with Jasmine. Regards, TONI&GUY Milton Keynes. One of my favourite stylists in MK:) cuts are always amazing!! Hey Pippa, thank you for taking the time to leave us a review. We are always pleased to hear feedback from our customers and we are happy to hear that you enjoyed your experience with Katie. Regards, TONI&GUY Milton Keynes. Hey Sarah, thank you for taking the time to leave us a review. We are always pleased to hear feedback from our customers and we are happy to hear that you enjoyed your experience with Hannah. Regards, TONI&GUY Milton Keynes. Thank you for taking the time to leave us a review. We are always pleased to hear feedback from our customers and we are happy to hear that you enjoyed your experience with Joe. Regards, TONI&GUY Milton Keynes. Joe cut my hair beautifully, he listened and understood what I wanted to achieve and did a great job. Really friendly and both my daughter and I will be booking with him again! Hey Michelle, thank you for taking the time to leave us a review. We are always pleased to hear feedback from our customers and we are happy to hear that you enjoyed your experience with Joe. Regards, TONI&GUY Milton Keynes. After a not so good experience I was offered a free cut and blow dry. Joe is absolutely wonderful with my son, friendly and attentive and really makes the whole experience of my son having his haircut so enjoyable; he is very patient. Hey Karen, thank you for taking the time to leave us a review. We are always pleased to hear feedback from our customers and we are happy to hear that your son enjoyed his experience with Joe. Regards, TONI&GUY Milton Keynes. Hey Mike, thank you for taking the time to leave us a review. We are always pleased to hear feedback from our customers and we are happy to hear that you enjoyed your experience with Rachael. Regards, TONI&GUY Milton Keynes. Thank you for taking the time to leave us a review. We are always pleased to hear feedback from our customers and we are happy to hear that you enjoyed your experience with us. Regards, TONI&GUY Milton Keynes. Having moved to the area I was nervous about finding a new hairdresser. I didn’t need to be - Michelle was great at listening to what I wanted and did a great job. Hey Karen, thank you for taking the time to leave us a review. We are always pleased to hear feedback from our customers and we are happy to hear that you enjoyed your experience with Michelle. Regards, TONI&GUY Milton Keynes.